Disconnect each joint and mounting rubber. Remove heated oxygen sensor 2 (1) using Tool (A). Discard any heated oxygen sensor which has been dropped from a height of more than 0.5 m (19.7 in) onto a hard surface such as a concrete floor; use a new one. Before installing new heated oxygen sensor, clean exhaust system threads using oxygen sensor thread cleaner and approved anti-seize lubricant. Always replace seal bearings with new ones when reassembling. Discard any heated oxygen sensor 2 which has been dropped onto a hard surface such as a concrete floor. Use a new one. Before installing a new heated oxygen sensor 2, clean exhaust system threads using the oxygen sensor thread cleaner and apply anti-seize lubricant. Do not over tighten heated oxygen sensor 2. Doing so may cause damage to the heated oxygen sensor 2, resulting in the вЂњMILвЂќ coming on. Prevent rust preventives from adhering to the sensor body. If heat insulator is badly deformed, repair or replace it. If deposits such as mud pile up on the heat insulator, remove them. When installing heat insulator avoid large gaps or interference between heat insulator and each exhaust pipe. Remove deposits from the sealing surface of each connection. Connect them securely to avoid gas fume leaks. When installing each mounting rubber, use silicon oil to avoid twisting. Temporarily tighten nuts and bolts. Check each part for unusual interference and mounting rubber interference, and then tighten them to the specified torque. When installing each mounting rubber, avoid twisting or unusual extension in up/down, front/rear and right/left directions. 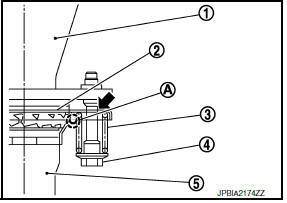 Securely insert seal bearing (2) into exhaust manifold (1) in the direction shown. Be careful not to damage seal bearing surface when installing. Install spring and tighten nut. Fasten stud bolts to the flange of exhaust manifold side to the specified torque before installing nuts. 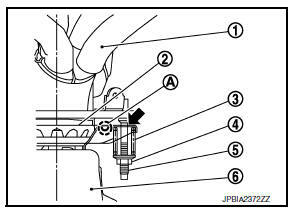 Ensure springs are seated correctly on the flange and not sitting on protrusion (A). Be careful that stud bolt does not interfere with mounting hole of exhaust front tube ( ). After installing, check that stud bolt does not interfere with mounting hole of exhaust front tube. Securely insert seal bearing (2) into exhaust front tube (1) in the direction shown. Install spring and tighten bolt. 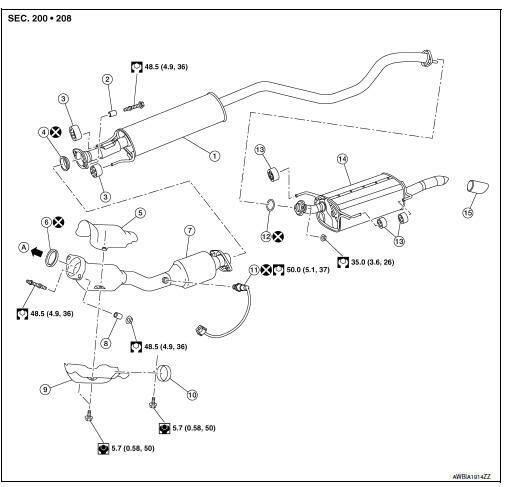 Be careful that bolt does not interfere with mounting hole of center muffler ( ). 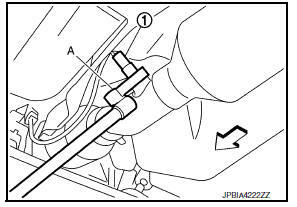 After installing, check that bolt does not interfere with mounting hole of center muffler. Check clearance between tail tube and rear bumper is even. With engine running, check exhaust tube joints for gas fume leaks and unusual noises. Check to ensure that mounting brackets and mounting rubbers are installed properly and free from undue stress. Improper installation could result in excessive noise and vibration.